Pneumatic operation of ordinary hand tools, what a great idea! 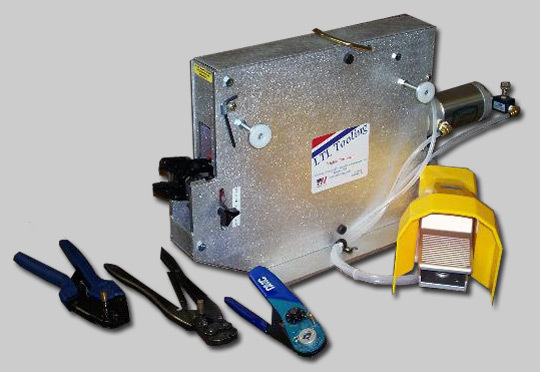 When purchasing these Hand Crimpers Air-Press machines, we will modify up to two (2) of your handheld crimpers for no additional charge and have them back to you within three business days. This machine, unlike competitors machines, has the U.S. Patented unique pressure equalization mechanism which applies equal pressure to both handles of the tool installed, eliminating tool handle breakage. Maintenance free, no oiling, no adjustments needed. Our machine accepts most if not all ratcheting type tools as well as non-ratcheting type tools. After modification, you can still use your tool for remote manual operation when needed. This machine is as close to Plug-n-Play as you can get, compared to any other machine on the market today. When purchasing these machines, we will modify up to two (2) of your hand held crimpers for no additional charge and have them back to you within three business days. controller. Note: There is no sound on this video. 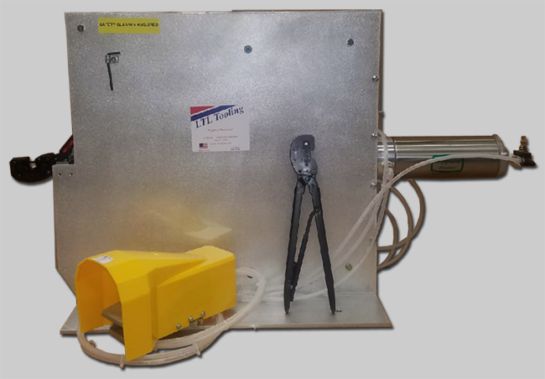 The Split-Cycle controller allows for the machine to grip a terminal, leaving both hands free to assemble and bundle multiple wires for insertion to terminals. This machine, unlike any competitor’s machines, has a U.S. Patented unique pressure equalization mechanism which applies equal pressure to both handles of the tool installed, eliminating tool handle breakage. Maintenance free, no oiling, no adjustments needed after initial tool installation/setup. Our machine accepts most if not all ratcheting type tools as well as non-ratcheting type tools. After modification, you can still use your tool for remote manual operation when needed. This video clip is of the Hand Crimper Air-Press HCAP-01. These machines may be mounted as illustrated or on their side to accommodate the operators in the field. Please note that the tooling change over time is minimized with modified crimping tools from nearly all industrial suppliers. 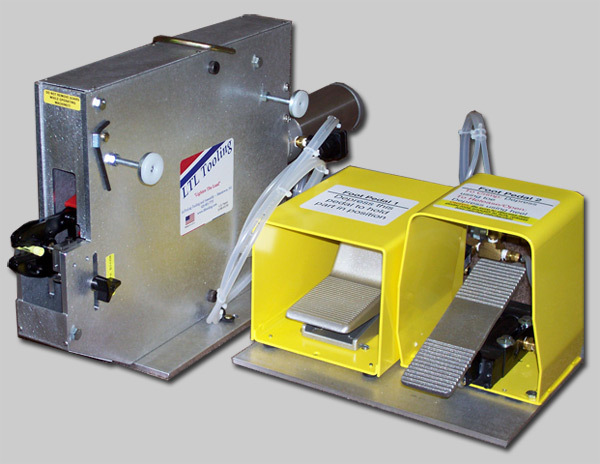 This machine, unlike competitor’s machines, has the U.S. Patented unique pressure equalization mechanism which applies equal pressure to both handles of the tool installed, eliminating tool handle breakage. After modification, you can still use your tool for manual operation if needed. Very economical tooling for today’s manufacturers and prototyping. The HCAP-03 model is specially designed for big gauge wire and “Heavy Head” crimping tools. This machine, unlike any competitor’s machines, has the U.S. Patented unique pressure equalization mechanism which applies equal pressure to both handles of the tool installed, eliminating tool handle breakage. Accepts “Heavy Head” crimping hand tools. When purchasing these machines, we will modify up to two (2) of your handheld crimpers for no additional charge and have them back to you within three business days.